The UMass Center for Microbiome Research was created with support from the University of Massachusetts President’s Science and Technology Initiatives Fund to accelerate our understanding of how the microbes that live in and on us influence our lives, our health and our environment. Our mission is to promote innovative and collaborative research, translate discoveries to practice, and inform our community about what microbiome research is discovering. UC San Diego is a world-leader in microbiome research, biomedical engineering, quantitative measurements and modeling, cellular and chemical imaging, drug discovery, “omics” sciences and much more. We draw interdisciplinary teams of these researchers together to push the boundaries of human understanding of microbiomes — the distinct constellations of bacteria, viruses and other microorganisms that live within and around humans, other species and the environment. The Microbiome Center The University of Chicago, Argonne National Lab, Marine Biological Laboratory The Microbiome Center brings together an unprecedented group of researchers and scientists who are leading diverse fields of study. By galvanizing this expertise, the Microbiome Center will tackle complex questions, help scientists quickly translate their findings to private and clinical sectors, and train the next generation of microbiome scientists. The PennCHOP Microbiome Program University of Pennsylvania, Pennsylvania, USA The University of Pennsylvania and Children’s Hospital of Philadelphia have launched a Microbiome Program to take advantage of new research in this area to advance the health of children and adults. The Center for Microbiome Informatics and Therapeutics (CMIT) Massachusetts, USA The Center’s mission is to streamline discovery of diagnostics and treatments for microbiome-associated disease by serving as the hub of clinically-relevant human microbiome research and engineering. UMass Center for Microbiome Research University of Massachusetts, MA, USA The UMass Center for Microbiome Research was created with support from the University of Massachusetts President’s Science and Technology Initiatives Fund to accelerate our understanding of how the microbes that live in and on us influence our lives, our health and our environment. Our mission is to promote innovative and collaborative research, translate discoveries to practice, and inform our community about what microbiome research is discovering. UC San Diego Center for Microbiome Innovation UC San Diego, CA, USA UC San Diego is a world-leader in microbiome research, biomedical engineering, quantitative measurements and modeling, cellular and chemical imaging, drug discovery, “omics” sciences and much more. We draw interdisciplinary teams of these researchers together to push the boundaries of human understanding of microbiomes — the distinct constellations of bacteria, viruses and other microorganisms that live within and around humans, other species and the environment. University of Pittsburgh Center for Medicine and the Microbiome University of Pittsburg, Pennsylvania, USA The University of Pittsburgh Center for Medicine and the Microbiome was established to foster innovative basic, translational, and clinical research in the microbiome. The Center is comprised of MD and PhD researchers in multiple disciplines who will work together to understand the role of the microbiome in health and disease and to apply this knowledge to develop novel diagnostic and therapeutic strategies. Such a center is important given that microbiome research is a rapidly expanding field that will impact multiple areas of human health and radically alter our understanding of many disease processes. The Center will benefit the University of Pittsburgh specifically by providing a home for interdisciplinary studies of the microbiome and integrating work of basic and clinical scientists with access to large clinical cohorts in order to efficiently test new ideas and rapidly disseminate pioneering treatments. Microbiome Center Penn. State University, Pennsylvania, USA The goal of the Penn State Micriobiome Center is to support transformative, interdisciplinary research in microbiomes by fostering long-term working relationships while simultaneously providing infrastructure and resources needed for increasing diversity and breadth of interdisciplinary microbiome research at Penn State. This will include structured and tacit educational opportunities unique to Penn State. Michigan Microbiome Project University of Michigan, MI, USA It’s mission is to elucidate principles underlying the structure, functions and dynamics of the human microbiome. The goal is to manage microbiomes for the benefit of human health. These objectives will be met by both observational and interventional studies in several human cohorts. Texas Children's Microbiome Center Baylor College, Texas, USA translates new knowledge about the human microbiome in different areas of medicine by pursuing metagenomic and microbiome research related to the care of women and children. Western Canadian Microbiome Centre University of Calgary, Canada Western Canadian Microbiome Centre (WCMC) is a multidisciplinary basic and translational research centre that will deliver innovation, excellence and leadership in microbiome research. WCMC is developed under the University of Calgary’s Infections, Inflammation and Chronic Diseases in the Changing Environment (IICD) strategic theme, an Eye’s High initiative with the vision of becoming one of the top research-intensive universities in Canada by 2016. WCMC will provide a platform by which scientist and industry can investigate the microbiome of plants, animals, and the physical environment for interactions that lead to chronic disease faced by many Canadians such as inflammatory bowel disease, asthma, allergies, obesity, diabetes and atherosclerosis. McGill University, Montreal, Canada The membership of MDTC currently spans 28 investigators from 3 universities (McGill, Montréal, McMaster), based on 4 Faculties at McGill (Dentistry, Medicine, Science and Agricultural and Environmental Sciences) and 5 departments (Microbiology and Immunology, Medicine, Paediatrics, Human Genetics, Institute of Parasitology). Centre for Translational Microbiome Research (CTMR) Karolinska Institute Sweden CTMR aims to better understand the contribution of the human microbiome to physiology and pathophysiology with the goal to open opportunities for development of novel therapies in the area of gastroenterology, reproductive health and neonatology. APC Microbiome Institute University College, Cork, Ireland The APC Microbiome Institute, founded in 2003, is about people working together across the boundaries of traditional research sectors. The APC has created a lively trans-disciplinary environment with clinicians, clinician-scientists and basic scientists from diverse backgrounds working in teams, sharing ideas and resources. Although focused upon the magic and mysteries of the gastrointestinal bacterial community, (the microbiota), the scale and scope of the work has become one of the fastest moving areas of biology, of relevance to all branches of human medicine and veterinary science, and is of growing importance to the economic welfare of society. Microbiome Research Network University of British Columbia, Vancouver The UBC Microbiome Research Network will build links between microbial ecology, evolution, and animal-associated microbiomes to change our understanding of the role of microbial communities in health, environmental balance, and parallels between them. Centre for Host-Microbiome Interactions (CHMI) Kings College, London UK. Our goal is to characterize the human microbiota, enabling the study of its variation with population, genotypes, disease, age, nutrition, medication and environment, and therefore opening avenues to modify it, in order to optimize the health and wellbeing of any individual. the Centre was originally created to bring together experts in Canada who specialize in probiotics and their application. Ever evolving, the Centre has championed extensive studies and collaborations in the fields of probiotics, microbiome and next-generation sequencing to become recognized internationally. The Microbial Ecology and Theory of Animals (META) Center for Systems Biology University of Oregon, OR, USA Devoted to understanding how host-microbe systems work and using this knowledge to advance human health. UCLA Microbiome Center UCLA, Los Angeles, CA, USA The UCLA Microbiome Center brings together UCLA investigators from different departments and schools interested in the human microbiome, representing a wide spectrum of expertise, spanning from oral biology, mucosal inflammation, metabolism, skin, to brain gut interactions. http://www.intestinal-microbiota.de/ Germany The German Research Foundation (DFG) initiated a new Priority Program (SPP 1656) entitled “Intestinal Microbiota – a Microbial Ecosystem at the Edge between Immune Homeostasis and Inflammation” to establish an interdisciplinary network of scientists and infrastructures. The goal is to achieve a functional understanding of microbe-host interactions in health and diseases, beyond rapidly emerging knowledge of largely descriptive compositional and metagenomic analyses. Alkek Center for Metagenomics and Microbiome Research Baylor College of Medicine, Texas, USA The Alkek Center for Metagenomics and Microbiome Research (CMMR) was established in 2011 by Dr. Joseph Petrosino in the Department of Molecular Virology and Microbiology at Baylor College of Medicine. The Mission of the CMMR is to serve as an international hub for the development and implementation of advanced technologies for the understanding of how the microbiome impacts health and disease, and for the translation of this knowledge into microbiome based therapeutics and diagnostics. The Center for Human Microbiome Studies Stanford University, CA, USA, The Center for Human Microbiome Studies will focus on enabling and connecting an interdisciplinary network of scientists and leveraging the most advanced technologies to rapidly realize the biomedical potential of the microbes that live within and upon us. The microbiome has a fundamental and continuous impact on human biology, with the capacity to promote health or to cause disease. A primary aim of the center is to develop precision therapies and interventions that target the human microbiome to maintain and restore human health. Host-Microbiome Center Forsyth The Forsyth Center for the Host-Microbiome Interface focuses on four areas of investigation. These include new ways to: ‘re-engineer’ the oral microbiome as well as modulate inflammatory host responses, including phototherapy; novel therapies that actively terminate inflammation and promote tissue regeneration (resolvins and lipoxins); induce anti-microbial peptides (AMPs) in oral epithelia by GRAS (generally-recognized as safe) compounds that suppress oral pathogens; and the replacement of pathogens with commensal bacteria using probiotics. Center for Science and Engineering of the Exposome (SEE) Virginia Tech, VA, USA The Virginia Tech Institute for Critical Technology and Applied Science (ICTAS)’s Center for Science and Engineering of the Exposome (SEE) is excited to announce their first mini research symposium. SEE is dedicated to establishing a fundamental understanding of the relationships between engineering design and the human exposome. The center embraces the VT-shaped student and an interdisciplinary approach that spans environmental engineering, microbiology, chemistry, nanotechnology, and aerosol science while emphasizing ethical practices for the public good. SEE recently played a fundamental role in uncovering the Flint Water Crisis. Malaga Institute of Medical Research Wellington, NZ Our research investigates the importance of interactions between the gut microbiome, diet and the developing immune system in early life. This is an exciting new frontier for human health. The Charles Perkins Centre has brought together a multidisciplinary team of microbiologists, neuropathologists, nutrition scientists and behavioural psychologists to investigate exactly how our gut microorganisms interact with the rest of our bodies. Their aim is to develop strategies that will take these interactions into account in helping us to maintain a healthy weight. University of Wisconsin Microbiome Portal University of Wisconsin, WI, USA We are researchers at the UW-Madison with a shared interest in microbiome science and engineering. We use the term “microbiome” broadly but it usually refers to the collection of microorganisms that interact with each other and with their surroundings (sometimes including a multi-cellular host). The Microbiome Portal is a website, and associated activities, that aim to showcase our work and connect us locally. UW-Madison microbiome researchers work in many different systems ranging from the human body, animals, soil, plants, lakes, food, wastewater treatment systems, and test tubes. We use combinations of -omics, computational biology, experiments, field work, and simulations to advance our understanding of how microbiomes function and how we can harness them to improve the quality of life for humans and the health of the environment. The Wisconsin Microbiome Portal is the nucleus of microbiome research at UW-Madison that will provide the means to unite the community around common ideas, sponsor workshops and symposia, and present the community of microbiome researchers at UW-Madison to the world. Western Canadian Microbiome Centre (WCMC) is a multidisciplinary basic and translational research centre that will deliver innovation, excellence and leadership in microbiome research. WCMC is developed under the University of Calgary’s Infections, Inflammation and Chronic Diseases in the Changing Environment (IICD) strategic theme, an Eye’s High initiative with the vision of becoming one of the top research-intensive universities in Canada by 2016. WCMC will provide a platform by which scientist and industry can investigate the microbiome of plants, animals, and the physical environment for interactions that lead to chronic disease faced by many Canadians such as inflammatory bowel disease, asthma, allergies, obesity, diabetes and atherosclerosis. 2) Microbiome and Disease Tolerance Center’ (MDTC) McGill University, Montreal, Canada -https://www.mcgill.ca/mdtc/members. The membership of MDTC currently spans 28 investigators from 3 universities (McGill, Montréal, McMaster), based on 4 Faculties at McGill (Dentistry, Medicine, Science and Agricultural and Environmental Sciences) and 5 departments (Microbiology and Immunology, Medicine, Paediatrics, Human Genetics, Institute of Parasitology). CTMR aims to better understand the contribution of the human microbiome to physiology and pathophysiology with the goal to open opportunities for development of novel therapies in the area of gastroenterology, reproductive health and neonatology. The APC Microbiome Institute, founded in 2003, is about people working together across the boundaries of traditional research sectors. The APC has created a lively trans-disciplinary environment with clinicians, clinician-scientists and basic scientists from diverse backgrounds working in teams, sharing ideas and resources. Although focused upon the magic and mysteries of the gastrointestinal bacterial community, (the microbiota), the scale and scope of the work has become one of the fastest moving areas of biology, of relevance to all branches of human medicine and veterinary science, and is of growing importance to the economic welfare of society. 3) Canadian Centre for Human Microbiome and Probiotic Research Lawson Health Research Institute in London, Ontario, Canada- https://www.lawsonresearch.ca/research-theme/microbiome-and-probiotics. 2) Metagenopolis (France)- http://mgps.eu/index.php?id=metagenomique_fonctionnelle. MetaGenoPolis (MGP) is funded by the French initiative Future investments. It aims to establish the impact of the human gut microbiota on health and disease, applying metagenomics technologies.To support this goal, MGP has developed a center of excellence in Human Intestinal Metagenomics. he Microbial Ecology and Theory of Animals (META) Center for Systems Biology is devoted to understanding how host-microbe systems work and using this knowledge to advance human health. Bringing together existing local expertise and new world-class recruits, and endowing them with the necessary common resources that will allow them to attain discipline-building, difference-making, mission-focused outcomes. The UCLA Microbiome Center brings together UCLA investigators from different departments and schools interested in the human microbiome, representing a wide spectrum of expertise, spanning from oral biology, mucosal inflammation, metabolism, skin, to brain gut interactions. also check out the apc microbiome institute in cork, Ireland. Understand your thoughts on this. Was trying to reduce redundancy. Guess it is unavoidable! 1) Novo Nordisk Foundation Center for Basic Metabolic Research, University of Copenhagen, Denmark-http://metabol.ku.dk/research/section-for-metabolic-genetics/. Section for Metabolic Genetics. The Section for Metabolic Genetics aims to explore the human genomic and gut microbiomic basis of metabolic traits with the long-term mission to discover and validate novel preventive and curative initiatives directed towards obesity, type 2 diabetes and cardiovascular disorders. 2) http://www.intestinal-microbiota.de/. The German Research Foundation (DFG) initiated a new Priority Program (SPP 1656) entitled “Intestinal Microbiota – a Microbial Ecosystem at the Edge between Immune Homeostasis and Inflammation” to establish an interdisciplinary network of scientists and infrastructures. The goal is to achieve a functional understanding of microbe-host interactions in health and diseases, beyond rapidly emerging knowledge of largely descriptive compositional and metagenomic analyses. is this focused on the microbiome in any way? Virginia Tech’s Science and Engineering of the Exposome. The mission of this research center is to harness engineering approaches to develop a fundamental understanding of the human exposome and the means to control it for the purposes of advancing public health, energy savings, and environmental sustainability. so would you say this is microbiome focused? 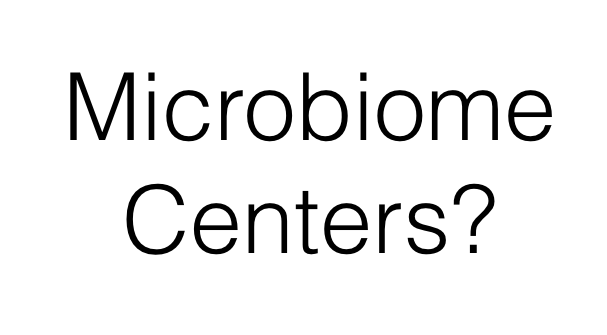 Yes, the microbiome is a big part of this center. The Cornell Institute of Host-Microbe Interactions and Disease is a “virtual institute” at Cornell, spanning multiple departments in several colleges. CIHMID provides an umbrella structure to promote and support innovative research in host-microbe biology at Cornell. Research within CIHMID may be fundamental or may be translationally applied in clinical, veterinary and agricultural contexts. Our research approaches are mechanistic as well as evolutionary and ecological. Our hosts include plants and animals. Our microbes are bacterial, viral, and fungal. In some cases, the interactions are pathogenic. In others, they are beneficial. And in many cases, they are conditional along the mutualistic-commensal-pathogenic continuum. The University of Pittsburgh Center for Medicine and the Microbiome was established to foster innovative basic, translational, and clinical research in the microbiome. The Center is comprised of MD and PhD researchers in multiple disciplines who will work together to understand the role of the microbiome in health and disease and to apply this knowledge to develop novel diagnostic and therapeutic strategies. Such a center is important given that microbiome research is a rapidly expanding field that will impact multiple areas of human health and radically alter our understanding of many disease processes. The Center will benefit the University of Pittsburgh specifically by providing a home for interdisciplinary studies of the microbiome and integrating work of basic and clinical scientists with access to large clinical cohorts in order to efficiently test new ideas and rapidly disseminate pioneering treatments. The Alkek Center for Metagenomics and Microbiome Research (CMMR) was established in 2011 by Dr. Joseph Petrosino in the Department of Molecular Virology and Microbiology at Baylor College of Medicine. The Mission of the CMMR is to serve as an international hub for the development and implementation of advanced technologies for the understanding of how the microbiome impacts health and disease, and for the translation of this knowledge into microbiome based therapeutics and diagnostics. Thanks. I have included the Malaghan Institute in my bigger list – as it seems to be a “Center” in the way I was thinking about it. The other ones here don’t well with what I was thinking so I did not include them in the bigger list . We have ~3-5 (depending on how you count) microbiome PIs at the moment, and are hiring more. Our full institute had about 10 PIs. We are just getting up and running with 3 of the 6 faculty hires completed. More to come soon! The interdisciplinary Microbial Sciences Institute (MSI) is the first of its kind. It brings together scientists with different expertise and background to study the inner workings of microbes and their interaction with the environment. Researchers in the Department of Biology and at the Center for Genomics and Systems Biology are using genomic tools to study a range of different infectious diseases, including the malaria parasite Plasmodium, species of parasitic trichomonad, tick-borne pathogens, Brugia malayi that causes lymphatic filariasis, and influenza and other respiratory viruses, to name a few. Research projects include studies on host-pathogen interactions, determining the molecular epidemiology of infectious disease agents, exploring infectious disease evolution and transmission, and developing predictive models of disease severity. The Center for Human Microbiome Studies will focus on enabling and connecting an interdisciplinary network of scientists and leveraging the most advanced technologies to rapidly realize the biomedical potential of the microbes that live within and upon us. The microbiome has a fundamental and continuous impact on human biology, with the capacity to promote health or to cause disease. A primary aim of the center is to develop precision therapies and interventions that target the human microbiome to maintain and restore human health. BIOASTER is the only health-related Technology Research Institute (TRI) in France selected by the General Commission for Investments [Commissariat Général à l’Investissement] as part of its Investment for the Future [Programme des Investissements d’Avenir] program. Since its inception in 2012-2013, BIOASTER conducts independent and collaborative interdisciplinary R&D activities on the frontier between basic and industrial development to ensure optimal alignment between research and innovation in the fields of infectious diseases and microbiology and expand our understanding of host-microbiota interactions. We have strong expertise in microbiology, clinical studies management, metagenomics/metatranscriptomics, immunomonitoring, preclinical models, protein & expression systems engineering, metabolomics & proteomics and bioinformatics. The Center for Microbiome Sciences & Therapeutics (CMiST) at the University of Washington has been set up to advance the understanding of the dynamic interaction between the microbiome and our own cells, to drive discovery of microbiome-based drugs to treat inflammatory bowel disease and other inflammatory disorders. The Duke Microbiome Center (DMC) was established to address the rapidly expanding interest among the public and scientific community in the pervasive roles of microbial communities in human health, the environment, and biotechnology. The mission of the DMC is to cultivate and support microbiome science at Duke University. We do so by providing an intellectual and educational environment that fosters collaboration and discovery, and by creating and supporting necessary resources at Duke University for research in the microbiome sciences.